Luis Sanjuán y Pedro Iglesias, Arquitectos, con la maqueta del proyecto. 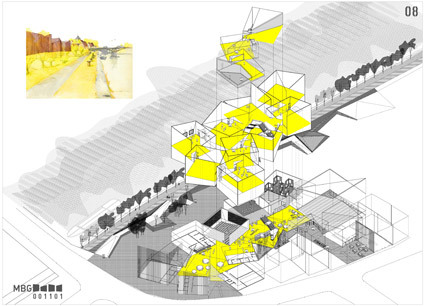 The architect of the BIVP Landscape, Luis Sanjuán, presented its proposal for the museum of the history of Baviera in the city of Regensburg (Alemania). It is an intervention on the bank of Danube to house the collections of the history of Baviera in a building-square where the empty spaces complement the architecture, extending the urban space. Distribution in buildings-yard serve to complete the program of 10.000 square meters of acting and a budget of 20 million euros.